Installing a dry well for the washing machine will help protect your septic system from failure. The soap and bleach from the washing machine will kill the good bacteria in your septic tank. The septic system needs these bacteria to function properly. The bacteria break down the sewage so the tank doesn't need to be emptied as often and the leach field doesn't get clogged. Purchasing a dry-well kit for proper installation is better then trying to install a homemade dry well. The dry-well kit comes with three interlocking side panels, a heavy-duty cover, a coupler, a riser, a surface vent, a sanitary T-fitting and a geotextile filter fabric. 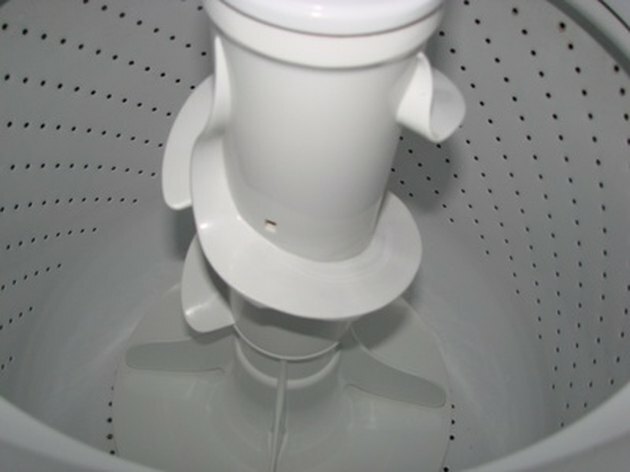 Hooking the drain on your washing machine to a dry well will lengthen the life of your septic system. Dig a circular hole, 4 feet around and 4 feet deep, where the dry well will be located. Dig a 1-foot-deep trench from the dry-well location to where the pipe from the washer machine water will run out from the house. Fill 1 foot of the hole with 1 1/4-inch crushed rock, and smooth level with a rake. Crushed rock is rock mechanically broken into small pieces, then sorted by size through filters of different size mesh. Knock out the small 1-inch holes in the three dry-well panels with a hammer; lay the panel on a block of wood and tap the "X" on the holes. Knock out the 4-inch hole in the lid, as well. Snap together the three interlocking panels and pop on the cover. Wrap the geotextile filter fabric around the dry well. Cut off the extra fabric and use duct tape to secure the fabric on the dry well. Place the dry well into the center of the hole on the 1-foot layer of 1 1/4-inch crushed rock. Fill in around the sides of the dry well with the 1 1/4-inch crushed rock in a uniform fashion, to ensure the dry well panels do not tip over or become unlevel. Only fill to the cover of the dry well with the 1 1/4-inch crushed rock. Slid the sanitary T-fitting into the dry well with the "T" opening facing the trench. Use schedule 40 PVC pipe to run from the T-fitting through the trench into the house. Use a level to put a slight pitch in the pipe from the dry well to the house, about 1/4 inch per foot. Push dirt under the pipe to hold the pitch. Use PVC primer and glue all the connections, including the T-fitting, in the dry well. Install the vent on top of the sanitary T. Cut a piece of schedule 40 PVC pipe to fit between the T and the vent, if necessary, to bring the vent level with the finish grade. Lay the rest of the filter fabric over the 1 1/4 inch crushed rock before backfilling the hole. If you use the 1 1/4 inch crushed rock to the finished grade, discard the rest of the filter fabric. Backfill the hole and the trench. Do not cover the vent with dirt.